Index in Order of Tracking No. 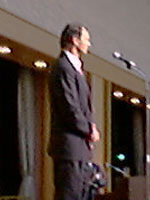 Dr. Georgeff (Conference Chair) making a speech at banquet. 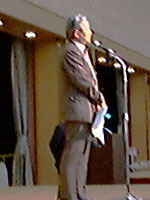 Prof. Ohsuga (National Commitee Chair) making a speech too. 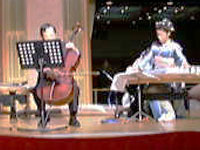 Prof. Furukawa (Local Arrangements Chair) [leftside] playing a cello. The other lady playing a KOTO, a Japanese harp. NOTE: Housing Application Deadline is June 20. The Correct E-mail addr of Nippon Express Co. is nittsur1@mxr.meshnet.or.jp The address in the registration brochure is wrong. All Call for Papers, Proposals and Nominations already have been closed ! Letters to authors of accepted papers and papers invited to the poster session were all mailed out by 2nd-day air on Mar. 26 and Mar. 27. Letters to authors of papers that were not accepted were all mailed out by air mail on Mar. 28. It has come to our attention that, as of Apr. 15, some of the authors of papers who were not accepted have still not received their letters and reviews. This seems to particularly be true for authors in Japan. We very much regret this delay, and don't know why the mail is taking so long to get there. If you still have not received your letter and reviews, please send email to "ijcai@aaai.org", with your tracking number if possible, and we will send you the letter and reviews by email. This page has been accessed 8,436times duaring Jun.1 - Sep.30, 1997.